This website provides information about Long-Term Care (LTC) homes in Ontario. LTC homes are co-funded by the provincial government and residents who live in the home. The Ministry of Health and Long-term Care conducts inspections of LTC homes to ensure they are being operated in compliance with provincial legislation and regulations and that residents receive proper care. 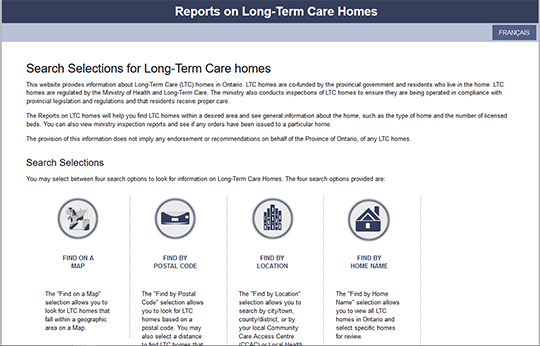 The Reports on LTC homes will help consumers find LTC homes within a desired area and see general information about the home, such as the type of home and the number of licensed beds, along with ministry inspection reports for each home.